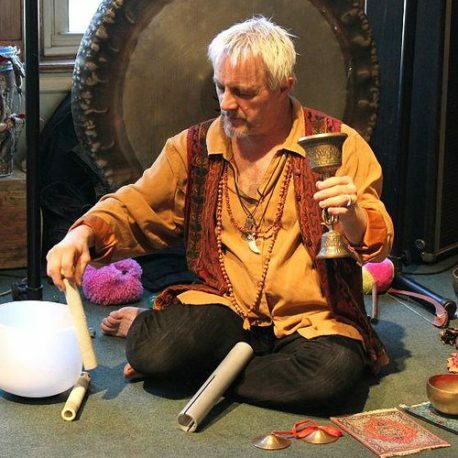 Preston Klik's Ocean of Devotion Gong and Singing Bowl Sound Healing Meditation is a gentle yet dynamic acoustic sound journey. This richly cinematic musical odyssey is as beautiful to the eye as it is to the ear, heart, body, mind and spirit. Preston plays a 36-inch Heart gong, plus crystal singing bowls, Tibetan singing bowls, ocean drum, water drum, thunder drum, 2 smaller gongs, chimes, monolina, and more. "If prayer had a sound, this might be it." Remove barriers between your Self and your fullest expression of Love. Use sacred sound to dissolve and release dis-empowering stories. Align your Self with Source so that Spirit can express through you...AS you. "The Gong is perhaps the most powerful, and the most mysterious instrument. Gong Meditations are deeply nourishing and restorative. Through the intense vibrations of the sound, the body and mind are able to relax and surrender to healing energies, and as the waves of sound wash over participants, a deep energetic clearing occurs, leaving the participant feeling balanced, peaceful, and light. Thank You Preston!" "One of the most extraordinary things I’ve ever experienced." "I was incredibly touched, moved, inspired, and freed by the Ocean of Devotion experience. I feel lighter and more joyous than I have in a long while." Doors open by 5:45 pm. Please allow ample time to park and arrive early, no late entry once the event begins. Bring a yoga mat, blanket, etc., if desired. This event has sold out in advance every time, so book early! IF YOU BOOK YOUR TICKETS NOW.